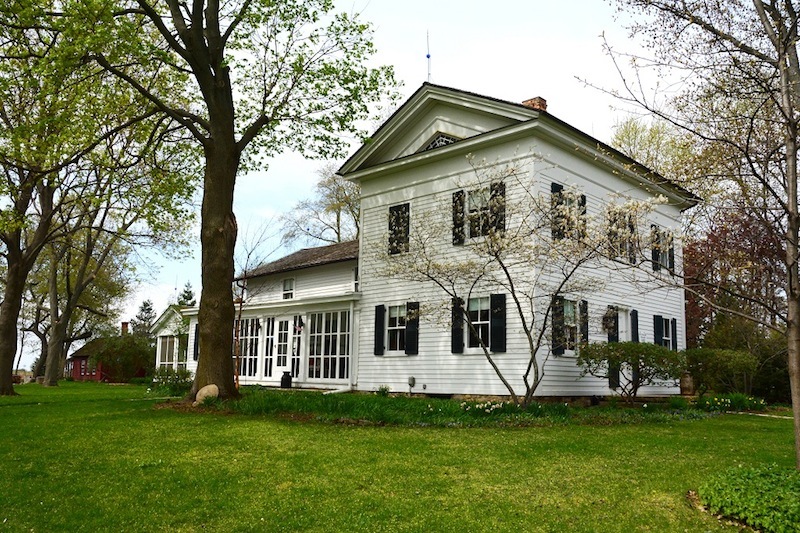 RICHMOND – The public is invited view a historic Richmond farm at 1:30 p.m. Sunday, Aug. 23, when the McHenry County Historical Society’s Historic Sites Committee gathers to plaque a 1852 Greek Revival home once owned by a celebrated family. 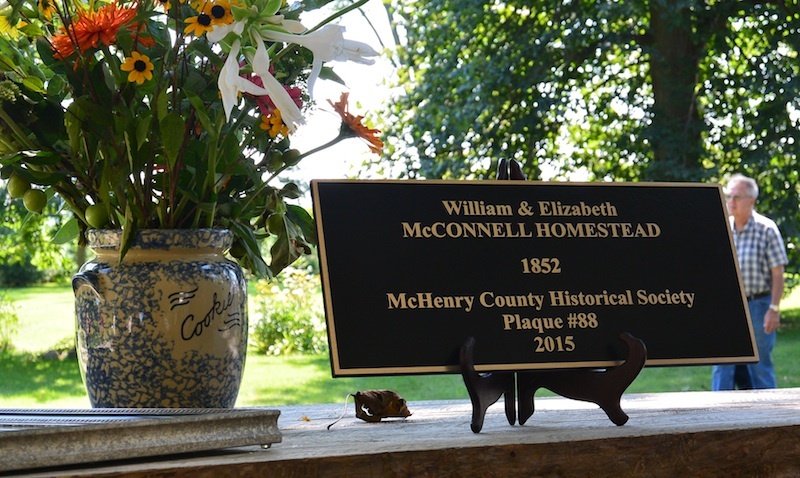 The significance of the William McConnell homestead, located at 6119 Broadway Road, is unmatched by most of McHenry County’s first settlers, because of his accomplishments and how he shaped the history of Richmond. William Alexander McConnell served as postmaster, school director, associate county judge, state representative and legislator, county board chairman, and – eventually – county commissioner. But McConnell came from humble beginnings. The only survivor among five sons, this carpenter and farmer came to McHenry County from Pennsylvania in 1837 – while the Indian wars and massacres still raged. After spending the night under an oak sapling next to the north branch of the Nippersink Creek, McConnell filed his claim. By the winter of 1838, William and Elizabeth Bodine McConnell returned to McHenry County and built a sturdy 16-by-18-foot cabin near that same oak tree. It served as their home for 15 years and was the birthplace of their three sons, Abraham, John and George. In 1840 McConnell was able to buy his claim from the government and, through time, added to it, eventually owning 1,400 acres. In 1841 he donated land to build the first schoolhouse in Montelona (later known as Richmond) Township and he helped establish and erect the first township church. With few, if any roads, McConnell rode or drove his horse, time after time to public meetings at the county seat in McHenry, then later to distant Woodstock. Besides establishing a cheese and creamery factory in Richmond, McConnell owned so much land, that that he was able to give each of his sons their own 500- acre farm, complete with livestock, crops, a house, outbuildings and enough grain to last an entire year. When William and Elizabeth McConnell built their first modern residence on a hill in 1852, only two states existed west of the Mississippi and the Gold Rush still was drawing fortune-hunters. The two-story, five-bedroom house – crafted of the finest materials available – reflected the McConnell’s success. Between 1852 and 1872 the house grew, along with his family. A front porch was added and windows were replaced around 1872. Indoor plumbing, along with a modern kitchen, was added in the 1950s. William A McConnell was known as a dignified, courteous and kind family man, devoting 30 years to the growth and shaping of McHenry County. Upon retirement, in 1872, William and his wife built a small Greek Revival home across the street and lived there the rest of their lives. William died in 1887, and Elizabeth followed him in 1888. 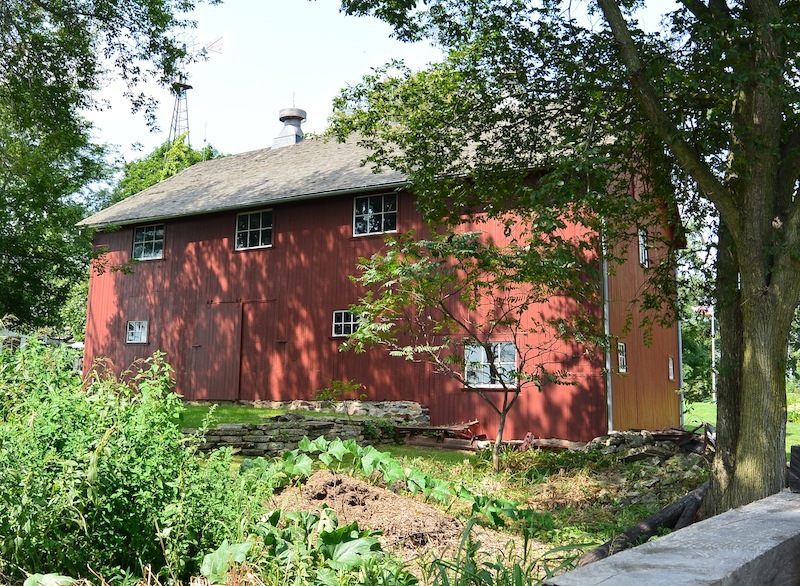 The larger home was given to his son John and remained in the family until 1987, when John Drummond and Romalda “Rommy” Lopat purchased the McConnell homestead. But by now, the house, grounds, and barn had deteriorated into severe disrepair. Weekend by weekend, year by year, John and Rommy worked to stop the destruction, then stabilized and upgraded this historic home. The front porch, dangerously dilapidated and beyond repair, had to be removed – along with the original attached carriage/wood shed. A new structure of the exact same footprint and proportions replaced the original carriage/woodshed and today serves as a guest apartment and screen porch. The original distressed woodshed wallboards can be seen, repurposed for a vaulted ceiling. The main structure’s hand hewed oak floor beams still retain their original bark and the bold Egyptian Revival front parlor trim and doors, are complete, with the original faux finish. Much of the exterior siding and trim are original including a unique triangular pediment window in the east gable. This window is highlighted by the larger triangular pediment in the gable which is a hallmark of Greek Revival houses. Several interior doors, locks, floorings, and plaster walls are also original to the home. Even the ‘50s kitchen, with its Geneva metal cabinet and red Formica countertops, has been painstakingly retained. 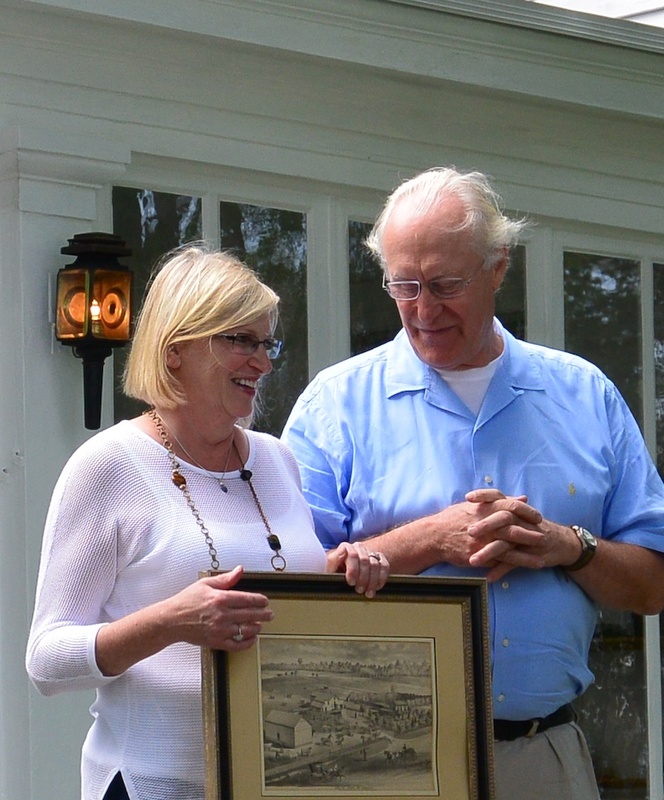 From the beginning, Historic Sites Committee Chairwoman Grace Moline said, John and Rommy recognized the historical significance of the McConnell Homestead and worked to preserve and maintain it for future generations. About 100 people attended the open house Sunday, Aug. 23.